Add dimension and shine to your hairstyle by using your choice of hair highlighting kits. Look for a color that will complement your hair color, whether it's brown or light blonde. These hair highlighting kits are designed to be simple to use at home, with tools such as caps and highlighting wands included. 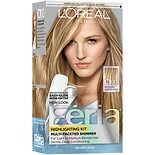 L'Oreal and Revlon offer various shades and types of highlighting kits here at Walgreens.com. Start your hair color transformation with an all-over hair dye. Find the color and formula that best suit your needs. Many hair color treatments are ammonia-free to help keep your hair healthy. Using the conditioner that comes with many hair color kits can also help revitalize and soften your hair. Use your hair dye for root touch-ups or change with the seasons, going beach blonde in summer and spicy red in fall. Care for your hair year-round with the shampoos, conditioners and other hair care products for your hair type. There are color-enhancing shampoos for a variety of shades and colors, as well as color-enhancing conditioners. Protect your color from heat styling with heat protection sprays and gels that also hold your style throughout the day.